I'm doing 3 DavidsTea spring collection reviews. Mostly because none of the others made me particularly want to spend money on them. 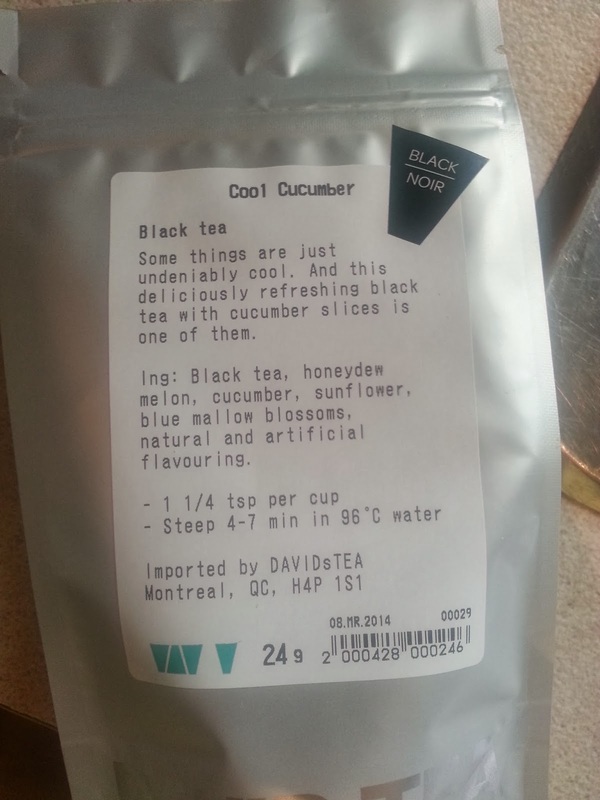 And this is the first; Cool Cucumber by DavidsTea. This tea smells almost exactly like those cucumber melon scented lotions, just with a sorta minty undertone. And I honestly don't know what to make of that. My entire room reeks of the stuff with just one pot! I honestly think if they made this tea for an iced tea, it may sound/smell more appealing? I'm going to try some iced and review it in here. This is my first time tasting it, so I'm tasting as I review. And reviewing before I go to the accountant! Honestly there is nothing remarkable about this tea. You get a SLIGHT aftertaste of its scent, but mostly you can smell it after you've swallowed. It's a pretty boring tea to be honest. Also, a little confusing. A black tea, with cucumber and honeydew melon? Black teas, as we all know, are fairly strong in flavor. A nice black tea lets you know what it is in a bold and pleasant way. 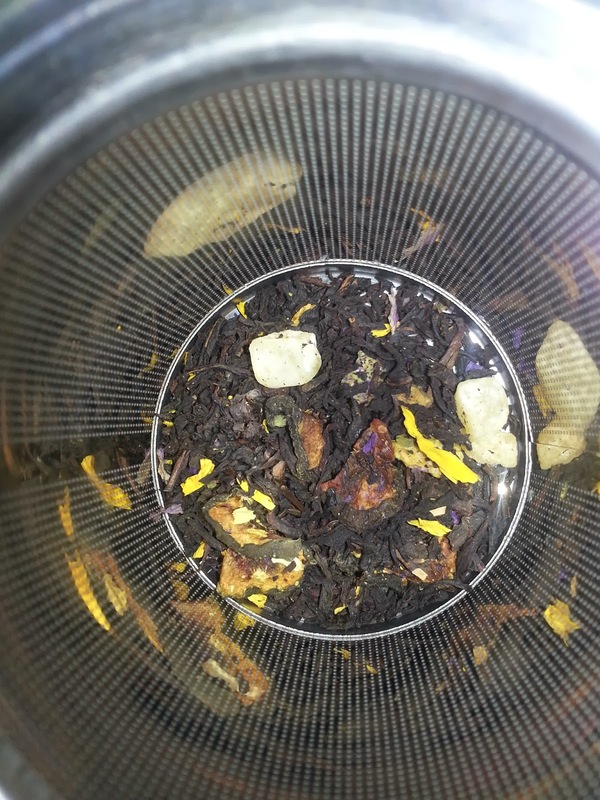 Adding flavors to black tea means you want really complimentary additions. Not two very mild flavors. Cucumber is yummy, but mild and watery. A fresh flavor. Same goes for honeydew melon. They had to add artificial flavors to it, which doesn't bug me in principle, but in practice, this could have been avoided by someone thinking it through a bit more. It's why Buttered Rum (the review to come later) works. 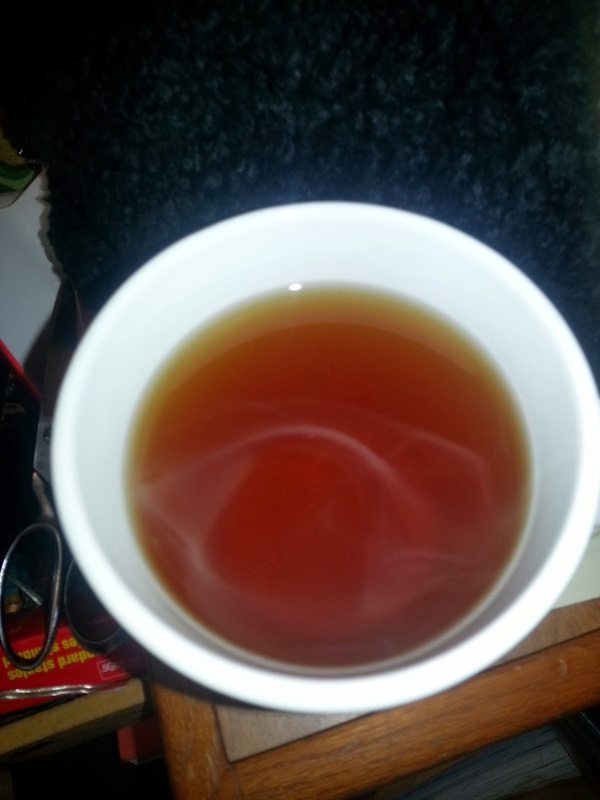 All strong flavors added that help round out and mellow out the black tea. When it's iced, I'd say it tastes about the same...maybe a little bit better? I dunno. I'm just very underwhelmed. I didn't finish my pot. I'm not buying any more.